Does anyone know where either 553 or 555 went? I'm not sure which one is still used on the UP North but where did the other one go to? Both of those are actually privately owned. I can check on the number of the one I know is still out there the next time I get to Ogilvie. To ride in those cars, you need special/private access. It is possible that the second car you speak of is not in service, either because the owner doesn't want to pay to have it be part of a train, or it could just be out of service for repairs. As far as I know, there is only one private coach still running on the UP North at this time. I know one of the cars leaves on a NB North Line train from Ogilvie around 5pm, estimated time. 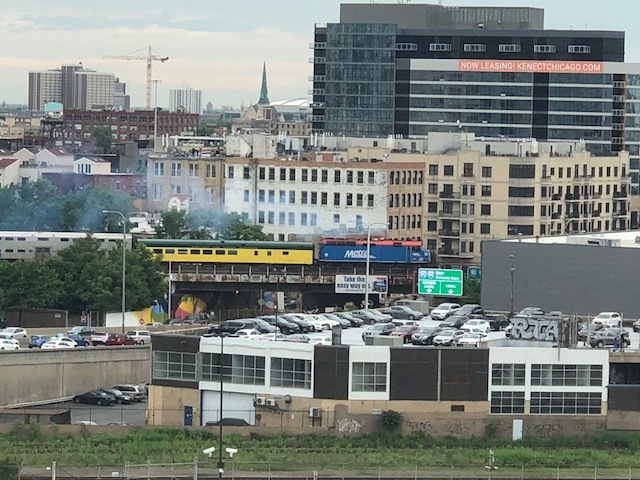 I recently moved into an apartment in River North with a great view of the UP North line. 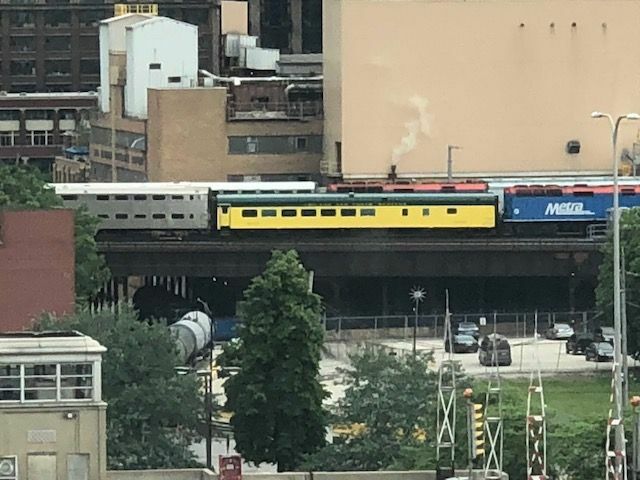 I thought I saw 553 or 555 painted in the original yellow and green colors and now I can't seem to see that train in the AM or PM, although I don't know which train it is. Anyone have an update? The train with the private car is #320 in the morning & leaves Kenosha at 6:53 & arrives at 8:26. Only one platform is long enough for it, which is tracks 7 &8. It's #341 in the evening & leaves at 5:03 & arrives Kenosha 6:27. At one time, it ran express from Madison St. to Highland Park, but now makes a few intermediate stops. There used to be three private cars, one of which was I believe 6300 & originally had the name "Deerpath" painted on the side in a flowing script, but it was removed, possibly because the other cars got the nicknames "Cowpath" & "Psychopath"! Well known streets in Lake Forest. I will look today. Does anyone know if it was painted back or am I losing my mind? And here it is at 5:37 heading north. Bonus points to anyone who can guess what street my place is on!! My Question is what stop do these people get off on at? I ride in the car right after it and we always pass the station to make sure rear is on. Most of them are from Lake Forest. There was a Tribune story about them about 9 years ago. It also points out that it technically isn't a Metra car, as the club contracts directly with the UP, but riders have to pay both club dues and Metra fare. I wonder why they painted it back??? ?